One of my earliest childhood memories is my father taking me to Elias Brother's Big Boy and getting to sit in one of their booths. I couldn't have felt more important if we were seated in a spaceship. This experience of mine was both a special yet also an ordinary experience. Almost everyone feels superior in a restaurant booth! How often have we heard a customer request table seating instead of a booth? Probably never, because everyone has a table and chairs at home. One of the thrills in going out to eat is sitting in a restaurant booth. Being both public and private at the same time, it's the best of both worlds. If positioned against a wall, it only has one means of access, and with high backs, such a booth can seem like a small room. Sound transmission becomes muffled, so conversations are more private while minimizing the noise from neighboring groups. The bench seating allows patrons to cozy up to each other or to spread out their belongings without fear of passersby plucking their precious valuables away. The customer also benefits from not enduring the constant flow of humanity rushing past them while they sit defenselessly in their chairs at their table. Some of this humanity is in the form of food servers and table bussers that might drop a steaming bowl of French Onion Soup or a tray of dirty dishes on the helpless patron at any moment. Of course, these accidents rarely do happen, but they nearly always ALMOST happen. Even a near miss with such a projectile is more than the average restaurant goer is willing to endure. Simpler Access When seated in a restaurant booth, there is only one direction from which all things (both good and bad) can come. Though this may seem to only benefit the guest, the staff also wins from not having to dance around the table to serve and retrieve everything from the proper side. The end result is quicker service allowing for faster table turnover. 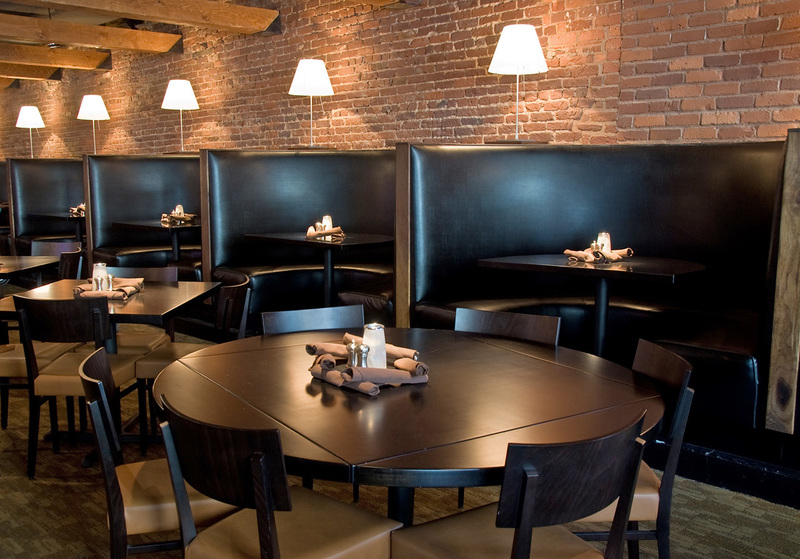 With all of the obvious advantages to custom restaurant booth seating, it's no wonder they have been an American favorite for generations. The only trouble is that styles change, and it can be difficult to know what to choose or how to get a practical and comfortable booth set up in your dining room or hospitality space. Fortunately, we here at Modern Line Furniture can walk you through the process of design and booth selection from beginning to end. Just let us know what your vision is. Whether your idea is just a picture you've seen of something you liked, a piece of furniture that caught your eye, or maybe it's just some doodles on the back of a cocktail napkin! 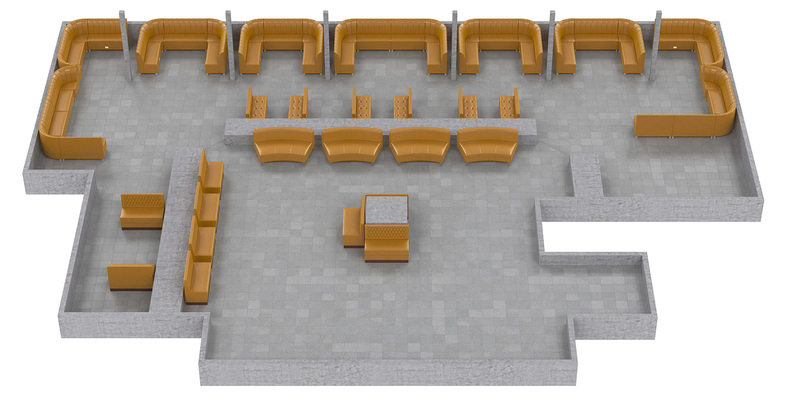 We can work with you from there and eventually develop a full 3D floor plan if you can provide the room dimensions. 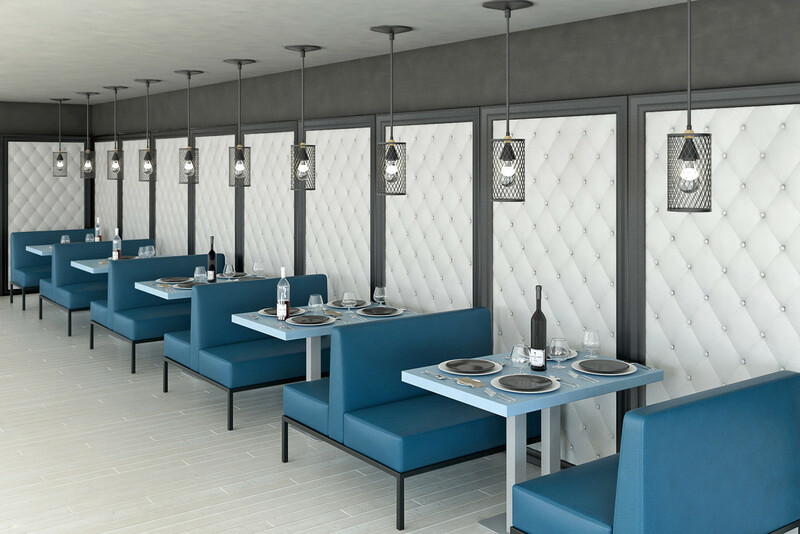 Before you know it, our New Jersey factory will be ready to deliver our high-quality American made custom restaurant booths!